On May 25, leaders of all 28 NATO member states met in the newly constructed multi-billion dollar headquarters in Brussels. The gathering came on the heels of a complex global political backdrop. For some of these leaders, President Emmanuel Macron of France, and President Donald Trump of the United States, this meeting marked their first appearance to the multilateral forum. For others, such as Prime Minister Theresa May of the United Kingdom who is currently undergoing a general election, this could possibly be her last appearance. In contrast to former NATO summits, this meeting carried a different tone brought forth by President Trump’s remarks about the organization and its members. During his campaign, then-candidate Trump referred to the organization as obsolete, and demanded that partners increase their financial participation. These comments resurfaced during President Trump’s vague and unstructured NATO speech which intensively pressured all members to meet the mutual agreement of 2% of GDP spending on national defence, stressing that their inability to meet the agreed upon quota was unfair to American taxpayers. Though the spotlight was fixated on all NATO member-states and the future direction of the organization under new American leadership, the meeting’s level of importance resonated in different regions of the world. Because NATO forces have successfully managed to keep relative peace and have efficiently provided support to various non-NATO military operations, it is imperative for non-NATO members to evaluate what a possible shift to NATO’s course of action would mean for their respective regions. Since 2005, NATO forces have provided various forms of military support to the African Union (AU). The initial operation was launched to support the AU Mission in Darfur, Sudan (AMIS). NATO coordinated strategic air support by transporting 31,500 troops as well as 50 AMIS civilian police officers into Darfur. During the mission, training was provided in strategic-level and operation planning, lessons learned, and information management. In January 2007, two years after its initial involvement, NATO accepted an additional request to assist the AU Mission in Somalia (AMISOM) by providing similar support as it did for the AMIS. In May 2005, in the hopes of advancing cooperation and strengthening ties, NATO and the AU signed an agreement, which formalized the status of the NATO Liaison Office to the AU headquarters in Addis Ababa. The agreement aims to reduce bureaucratic impediment and accelerate cooperation between both organizations. The office will served as the primary point for NATO’s operation in the region as well as bilateral initiatives with the United Nations and the European Union. Together, the organizations have also contributed to the establishment of an African Standby Force (ASF) intended to be deployed in the region in times of crises, as part of the AU’s efforts to acquire the capabilities for long-term peacekeeping initiatives. A change in NATO’s operations on non-NATO territory could be the end of these initiatives. President Trump’s assertion to put America First as part of a new foreign policy solely focused on putting American interests at the head of the decision making process, and his skepticism of the necessity and importance of multilateral organizations, threatens the survival of NATO-AU operations. 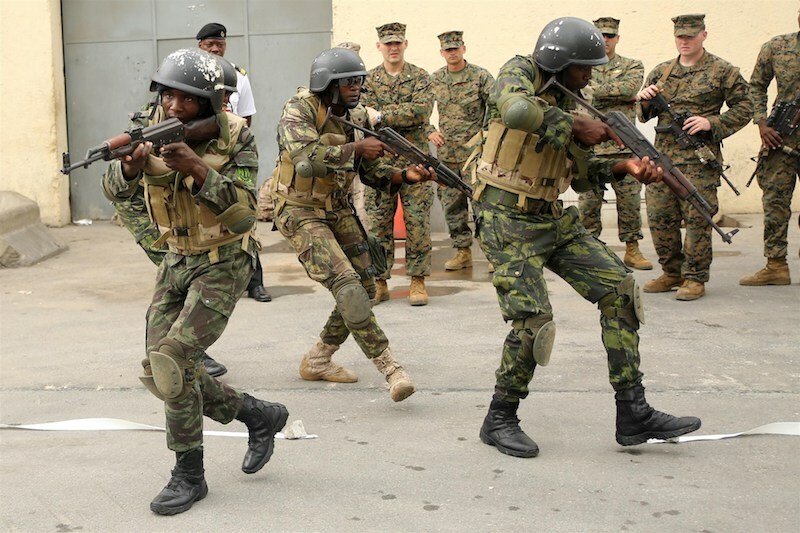 With growing concerns surrounding the rise of jihadism in Western Africa, with groups such as Boko Haram, and the persistence of the armed group Al-Shabaab in the Eastern region, an increase in bilateral operations, such as NATO-AMIS and NATO-AMISOM could be needed. The United States has also contested China’s forceful acquisition of territory in the South China Sea. The rapidity and scale of the Chinese island-building program has alarmed countries in the region about a possible revert to Chinese regional imperialism. In February 2015, President Obama solidified America’s opposition to China’s expansion by reinforcing the United States’ air and maritime operations in international territory. In January 2016, the United States Navy fired missile-destroyers within 12 nautical miles, the conventional limit of territorial waters, off the Chinese artificial islands. In a recent interview, NATO General and Chair of the NATO Military Committee, Gen Pert Pavel states that NATO would not intervene militarily in the South China Sea territorial dispute due to the lack of legal platform: Gen Pavel stated “We’re trying to stay as much within our region and not interfere in other region’s issues.” It would be correct to assume that a NATO mission in the South China Sea would be completely removed from its regional prerogative; however, the organization is inclined to support countries in the region to develop their military capabilities, best practices, and security methods. In addition to his comment about NATO’s attempt to keep out of the South China Sea, Gen Pavel also stated that NATO would have to tread carefully on the issue, due to China’s unclear intent in the South China Sea. Nevertheless, he asserted that NATO is prepared to support solutions based on political and diplomatic negotiations. In a similar approach to NATO’s involvement with the AU’s military operations, it is more likely that if NATO aims to halt China’s expansion, it would do so indirectly. Photo: Angolan Marines, known as Fuzileiros Navais da Marinha de Guerra Angolana (MGA), practice clearing a room in Luanda, Angola (2015) by Staff Sgt. Steve Cushman via AFRICOM. Listed under Public Domain. Why does NATO’s deterrent posture need updating?